Home » General News » Share The Plate This Sunday, Dec 7, with Partakers. Share The Plate This Sunday, Dec 7, with Partakers. We share our Offering this Sunday, December 7, with Partakers. It is a non-profit organization which provides mentoring to inmates who are enrolled in the Boston University Prison Education Program (BUPEP) or who take Distant Learning correspondence courses; and it bridges the divide between those inside and outside of prison. 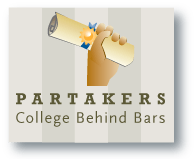 Partakers’ College Behind Bars Program has proven to be extremely successful. Inmates who have gone through the program show a 2% recidivism rate, compared with the national recidivism rate of 63%. Although Partakers does not promote a particular religious tradition, it recognizes and embraces the universal faith teaching, “Do unto others as you would have them do unto you.” Therefore Partakers is described as faith-based, but non-sectarian. Our Congregation, since 2006, has been one of 30 faith-based and community organizations that serves as one of Partakers mentoring teams. Ernest N. Benjamin (Nate), the inmate we mentor, passed with high marks the courses that were Boston University’s requirement for his entering College Behind Bars.Then, the requirement was changed and he had to pass math and English tests as well. He has always had great difficulty with math, and has struggled to attain the proficiency required to pass the test. Last Spring he finally succeeded, but again the requirement was changed. Boston University ruled that only those fifteen prisoners who scored the highest where Nate is imprisoned could enter their Program, and Nate scored sixteenth. But he is again working to master the math test -this time even better – when he takes it again next Spring. When we (four of us, then two, and for the last eighteen months or so, only one) first met him, it was obvious that Nate was a voracious reader and well-informed about current events. Through the years we have seen his writing and his speech improve greatly. He has developed through his active participation in a Toastmasters’ Group; the reading he has done for courses, for his Toastmasters’ presentations, and otherwise; through his presentations to Youth At Risk; and through his monthly conversations with his mentor(s) who are able to supply him with internet and other information about subjects he wishes to pursue. At least this mentor is grateful to Partakers for giving Nate and us the opportunity to have this relationship, and for helping former prisoners stay out of prison. Please support Partakers as much as you are able.